OR SAVE $10.00 when you buy our 4 product "Combo"
On a scale of 1-10, with 10 being the worst, if your chronic pain rates more than 5 or 6, then Bone Magic should be used along with the Mountain Magic All Natural Liniment. These two together are what we call the “Chronic Pain Duo”. 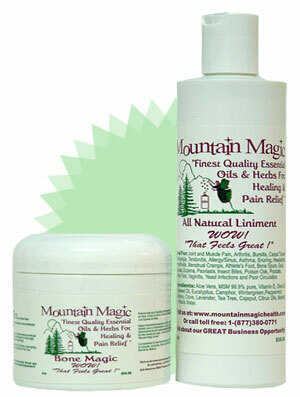 This dynamic duo works best and provides long term improvement when you rub in the Bone Magic first, as best you can, then apply the Mountain Magic All Natural Liniment on top. The Liniment with its tiny molecules, races into the bloodstream, increasing circulation, and pulling the heavier Bone Magic down with it, so it can relieve pain & repair your tissues. When you are in chronic pain, you may want to apply both products, then repeat the process as needed until you can go several days without pain. Once the swelling and pain goes down, just apply one application of each product for maintenance; to keep the inflammation under control. Each of these 2 products is usually about a 6 month supply. The limiment has saved me from sinus headaches MANY times these last few months! What I have done is use one of the round things used to remove make-up. I put some on one of those, wrap it in a kleenex & put to my nose - breathing deeply in & out several times. The I lay down with that in hand & continue to breath in & out periodically until the sinus headache is gone. I told my allergist about this. He has printed out what I told him (above), along with the page here on your site that tells about the product & he recommends it to all his patients now. I have used the "contact us" form here on your site, wanting to know more about the opportunity package - no one ever contacts me to fill me in. I am truly interested!